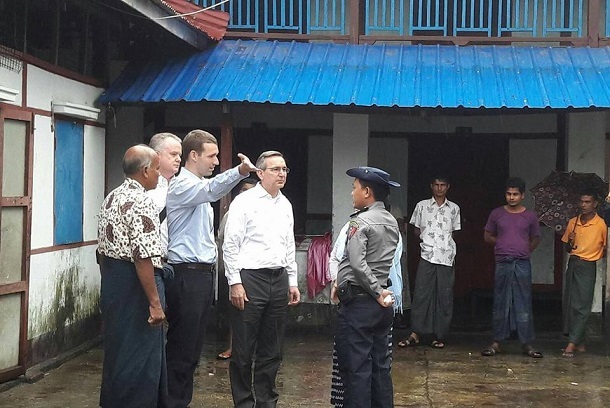 RANGOON — United States Ambassador Scot Marciel made his first trip to Arakan State on Wednesday. Talks were held in the state capital Sittwe with the Arakan National Party (ANP) and with stateless residents of a segregated Muslim ward, Aung Mingalar. Tun Aung Kyaw, secretary of the ANP—which represents the interests of the Buddhist majority in Arakan State—told The Irrawaddy that they received the ambassador at their head office in Sittwe. Scot Marciel, who started his post as US Ambassador to Burma in April, reportedly asked ANP leaders about their relationship with the ruling National League for Democracy (NLD) and the ANP’s plans for developing Arakan State. This was a pointed reference to their marginalization by the NLD, which controls the Arakan State government and appointed the chief minister from within their own ranks—angering the ANP, which has the largest plurality of seats in the state parliament, and which has since vowed to act in “opposition” to the NLD. The ANP have also been excluded from a high level committee on Arakan State, chaired by Suu Kyi and featuring the NLD chief minister alongside various Union ministers. Such “unacceptable” actions may include granting citizenship to large numbers of stateless Rohingya Muslims. The ANP have been adamant that most of those who self-identify as Rohingya are illegal “Bengali” migrants who do not belong in the state. The ANP have previously insisted that any granting of citizenship is carried out in strict adherence to the 1982 Citizenship Law, which precludes citizenship for most Rohingya as an “unrecognized” ethnic group in Burma. Scot Marciel then proceeded to Aung Mingalar, the only Muslim enclave remaining in Sittwe after anti-Muslim riots in 2012. It functions effectively as an internment camp, with a heavily armed police presence and restricted access in and out. Muslim community leaders complained to the ambassador that, contrary to their expectations, their condition had not changed significantly under the new NLD government. Particularly, they wished to regain freedom of movement, so as to access medical care and education and to participate in trading, as was the case before the 2012 riots. “Our first priority is to get back [to a] normal situation,” Zaw Zaw told The Irrawaddy after the meeting. He said that, during the 30-minute meeting, they discussed the government’s new scheme of issuing “National Verification Cards” (NVCs) to stateless Muslims, as a precursor to being scrutinized for citizenship eligibility under the 1982 Citizenship Law. The scheme has been met with suspicion by Muslim communities in some areas of the state, in part because the new cards bear no information on the religion and ethnicity of the bearer. Prior to his trip to Arakan State, the ambassador had met in Naypyidaw with State Counselor Aung San Suu Kyi, who branded the NVC scheme a positive “first step” for stateless Muslims aspiring to Burmese citizenship. However, according to Zaw Zaw, the residents of Aung Mingalar expressed distrust in the process. They considered it an unnecessarily convoluted and uncertain undertaking for those families who had lived in Arakan State over multiple generations. According to Zaw Zaw, the ambassador “promised” to relay their concerns personally to Suu Kyi, although he did not specify when he would do so. Some freelance journalists have posted on Facebook that the meeting in Aung Mingalar was closed to outsiders and they had been unable to gain information about it. Aung Mingalar resident Zaw Zaw commented on the relatively light security presence during the meeting, and the absence of state-level ministers—in direct contrast to the visit by Yanghee Lee, United Nations rapporteur for human rights in Burma, on June 23. “It’s quite strange. Nobody followed him,” he said. At the conclusion of her visit in Burma, Yanghee Lee publicly criticized the police in Arakan State for their intrusive conduct, which included photographing and questioning local interlocutors before and after her meetings with them. The US ambassador also met with the speaker of the Arakan State Parliament San Kyaw Hla along with other state government officials. The ambassador declared the US government’s intention of supporting agricultural development in Arakan State, although he reportedly did not go into the specifics of such engagement. Throughout the various meetings held in Sittwe, the ambassador avoided using either of the contentious terms “Bengali” or “Rohingya.” In April, Burmese ultra-nationalists protested outside the US Embassy in Rangoon against the Embassy’s use of the term “Rohingya” in a public expression of condolence over deaths in a recent boat accident. According to a subsequent Facebook post from the US Embassy, the ambassador also hosted a dinner for trade officials in Arakan State, “to discuss U.S. assistance efforts and how business and trade can improve the lives of communities” in Arakan State.